When I get together with my writing group we share a meditation before writing. I won’t relate the whole thing, but in short we do some deep breathing, send messages to ourselves that the time before us is for writing and that we should be open to creativity. Then we each take a moment to imagine that we are in a special place for writing, where creativity flows and nothing else matters. My own personal space is on a large rock in a river. The rock is warm and shaped perfectly for my body to sit and write. 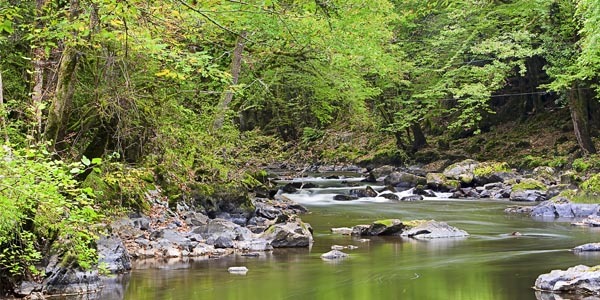 The river is surrounded by a deep forest far away from any of life’s problems. I think I’ll take a trip right now. Symbols are powerful. They can inspire, direct, identify and suggest meaning. In writing they can be used to identify something about a character. For example we would expect different behaviors from a character wearing a delicate cross than from one with a tattoo of a peace sign, though to some they can carry similar meanings. Symbols can also be used as tools of foreshadowing. Choose a symbol and brainstorm about that symbol’s meaning. Would it mean that same thing to everyone, or could its meaning change with the perspective of the viewer. Now give that symbol to a character and spend twenty minutes exploring your character’s relationship to that symbol. If you need help getting started, consider all the different ways a symbol could be important to someone. Is it a cherished memory? Is it an obsession? Does it represent faith? Does it tell the world something about them (like a super hero?). Does the image haunt them? Free your imagination and welcome symbols into your writing. NB. Symbols are all around us. If you are having a hard time finding a symbol to write about broaden you definition. Companies make use of them in their logos. Tattoo artist can tell you the deeper meaning of almost any image, and ancient cultures have prescribed meaning to animals and shapes since we began painting images on cave walls. ← As God is my Witness, I’ll Never Eat Olives Again!